Once a week, if you're wondering. heck is creating this stuff? 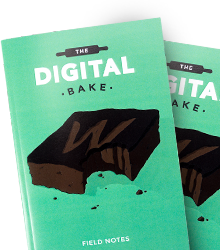 Support the Digital Bake and treat yourself at the same time. 48 Page A6 Dotted Field Note Book. My name is Aaron Grieve, some of you my know me from various places within the Webflow universe, like the Blog or the Forum etc... I'm a hard-core Webflow nerd and fan-boy!